Railpictures.ca - Photographer unknown, Dan Dell'Unto coll Photo: One sight you won’t find today in Thunder Bay: the ore dock trestle! CN GMD-1′s 1914, 1903 and 1910 cross the trestle by CN’s Port Arthur yard, where another pair of 1900-series GMD-1′s are visible in the yard along with lines of new cylindrical covered hoppers (note the “lemon lime” NSC-built aluminum CNWX cars, still shiny). Also note the classic 40′ boxcars traditionally used for moving grain to the port in the pre-hopper days, and even into the 90′s from light-rail branchlines. Visible below the trestle are CN 65′ gondolas staked up and loaded up with timber poles. Wood/lumber/timber (forested in northern Ontario, and also used by the local mills) and grain (taken from the prairies to the lakehead elevators for export) were both hot commodities in Thunder Bay. The 1900-series BB-trucked steam generator equipped GMD-1 units that had been assigned out of Spadina Roundhouse in downtown Toronto (mostly used used passenger commuter trains and local switching work) seem to have migrated to Thunder Bay for yard work in the early 1970′s. One of the tasks of which was to move hoppers and ore cars up the long sweeping wooden trestle to the ore docks by the lakehead. Today the trestle (originally built in the mid-1940′s) and right-of-way are long gone, but the abandoned ore docks remain, probably more costly to demolish than it’s worth (like many of the old port grain elevators no longer in use but still standing). Original photographer unknown (Al Chione duplicate), Dan Dell’Unto collection slide. | Railpictures.ca – Canadian Railway Photography – photographie ferroviaire Canadienne. Copyright Notice: This image ©Photographer unknown, Dan Dell'Unto coll all rights reserved. Caption: One sight you won't find today in Thunder Bay: the ore dock trestle! 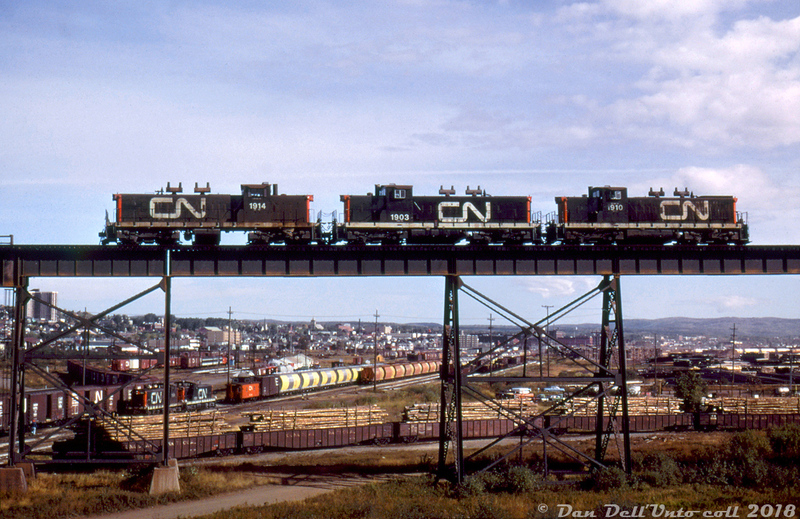 CN GMD-1's 1914, 1903 and 1910 cross the trestle by CN's Port Arthur yard, where another pair of 1900-series GMD-1's are visible in the yard along with lines of new cylindrical covered hoppers (note the "lemon lime" NSC-built aluminum CNWX cars, still shiny). Also note the classic 40' boxcars traditionally used for moving grain to the port in the pre-hopper days, and even into the 90's from light-rail branchlines. Visible below the trestle are CN 65' gondolas staked up and loaded up with timber poles. Wood/lumber/timber (forested in northern Ontario, and also used by the local mills) and grain (taken from the prairies to the lakehead elevators for export) were both hot commodities in Thunder Bay. The 1900-series BB-trucked steam generator equipped GMD-1 units that had been assigned out of Spadina Roundhouse in downtown Toronto (mostly used for passenger commuter trains and local switching work) seem to have migrated to Thunder Bay for yard work in the early 1970's. One of the tasks of which was to move hoppers and ore cars up the long sweeping trestle to the ore docks by the lakehead. Today the trestle (originally built in the mid-1940's) and right-of-way are long gone, but the abandoned ore docks remain, probably more costly to demolish than it's worth (like many of the old port grain elevators no longer in use but still standing). Original photographer unknown (Al Chione duplicate), Dan Dell'Unto collection slide. 1904-1917 were assigned to Neebing ( Thunder Bay) by April 1973. The 1900-series units were slow to get the “red cab” paint – possibly because so many of them spent the summer in Thunder Bay. I’m having trouble tracking down details on 1910 and 1914 (either new paint or when the tank came off 1914 could help date this photo), but 1903 was never given the red cab. Some smaller CN terminals didn’t receive updated materials for the 1973 paint scheme changes (i.e., stencils for zebra stripes and smaller noodles for noses) and kept painting units in the carbody wet noodle and/or black cab scheme as late as the early 1980s. This is why so many GP9s based around Fort Erie kept the wet noodle so late; same story for a lot of RS-18s (and RSC-14s) based in the Maritimes. There are a few photos floating around of the odd GP9 or SD40 with fresh zebra stripes but no noodle logo anywhere; these are early zebra repaints from a smaller shop. Mr Snake, 3 were rebuilt into early 1400′s, one was donated to a museum in Winnipeg, and the rest appear to have had been sold off to dealers like NRE. CN dumped most of their 567-powered GMD-1 units over time (1100′s and 1900′s) but kept their 1400′s that they had rebuilt with 645 power assemblies. Da, what happened to those 1900′s? are they todays 1400′s? Jakob, there were two orders of those aluminum CNWX cars built in 1975 & 1977, so I’m thinking it could be somewhere in the 1975-1979-ish timeframe. By 1979 and later I’m thinking there would have more red-cab painted GMD1′s floating around. This is awesome… so much to see. Those lightweight aluminum cylindrical covered hoppers were built in 1977, if it helps to date this… beyond that is is hard to say, and early 1980s would not be a stretch. My goodness. What a simply wonderful photo. Many thanks for posting this.